Indian economy has witnessed a flurry of initiatives such as Digital India, Make in India, Skills India, Swachh Bharat, Smart Cities Project, Mudra mission, GST introduction, Demonetisation etc. in the last two and half years. Our economy has been growing at roughly 7% during this time. However, the challenges continue to remain in the horizon. The Government of the day will naturally take steps in the Budget to move these further. Each of these initiatives have the potential to create new jobs and spur the economy further. Labour market reforms undertaken by the Government haven’t yet been any significant and hence, the impact produced so far have been less than desired. HR industry can expect the envelope being pushed further on this aspect. Given the strength that the Government has in the Parliament, we expect that the reforms will be pushed further. Our economy needs more flexibility in staffing the businesses and simplicity in administrating the laws that govern employment. Major reforms expected will be in the direction of harmonising the labour laws and simplifying the governance process. This could increase the share of formal sector employment from the current 9% to 25% over the next decade. This reform will create a huge social impact : employees will feel a lot more dignified in their relationship with their employers. A virtuous economic cycle of growth will get created given the fact that millions of people in our country will be able to access credit facilities and hence, consumption of products and services in banking, financial services, insurance, consumer durables, automobiles, healthcare, hospitality and entertainment. This can be a master stroke that the Budget can initiate. Infrastructure spend in an economy spurs confidence of citizens and a positive sentiment. The PPP models, foreign direct investments, land reforms and environmental clearance processes haven’t been the best yet to generate the desired outcomes. The bottlenecks due to multiple enforcement agencies and lack of alignment amongst various policies have come as speed breakers on the way to create new investments in sectors like power, mining, manufacturing, warehousing, supply chain and research in science, agriculture, biotech etc. Secondly, the Government is expected to reform the tax system so that the base of taxpayers increases and reduce tax rates for individuals to increase their spending power and companies have more cash available for investment. 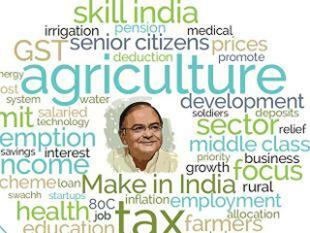 This budget can be the best possible time when some of these issues are addressed and policy measures are announced. The taps of Investments will automatically open up from within our country as well as external funding agencies. As a result of such investment, consumption patterns will increase and services sector such as BFSI, Retail, Entertainment, Hospitality, Healthcare and all other services will grow further leading to job creation and rise in earnings of individuals. Education and skill development are the two allied areas which need urgent attention. Government knows about it. In spite of various efforts in the last few years to produce skilled manpower, the efforts haven’t yet attained the critical mass that can assure the industry that the output of our education institutes meet their needs. At the same time, the students passing out of these institutes are not in a position to get employment using their skills and knowledge. There is an issue of misalignment between the objectives of the education system and the demand of the employers. Again, this budget is the time when the Government can announce measures to align the skill development initiatives and education system so that the inefficiencies in our system can be reduced. In summary, HR industry will be happy to see significant measures to reform labour laws, leap-frog investments in infrastructure and align objectives of education system with that of the demands of the employers.